Want to add a bit of atmosphere to your pictures? Then you could add a bit of smoke. One way is to hire a smoke machine but a more economical way is a simple bee-gun that bee-keepers use to get into their hives. This burns hessian rags or better still in my opinion, incense, which you get from any Catholic or high church C of E stockists. This has the effect of creating a pleasantly sacred air to your pictures that may or may not be conducive to relaxing your models – my experience has been always positive on this score. The bee gun creates a lot of smoke over a period of time as long as you keep topping it up with carbon tabs and incense. But beware, the gun gets very hot indeed! So in an interior give some thought beforehand as to where you are going to put it down. Bee smokers rust like crazy so better invest in a stainless steel one. 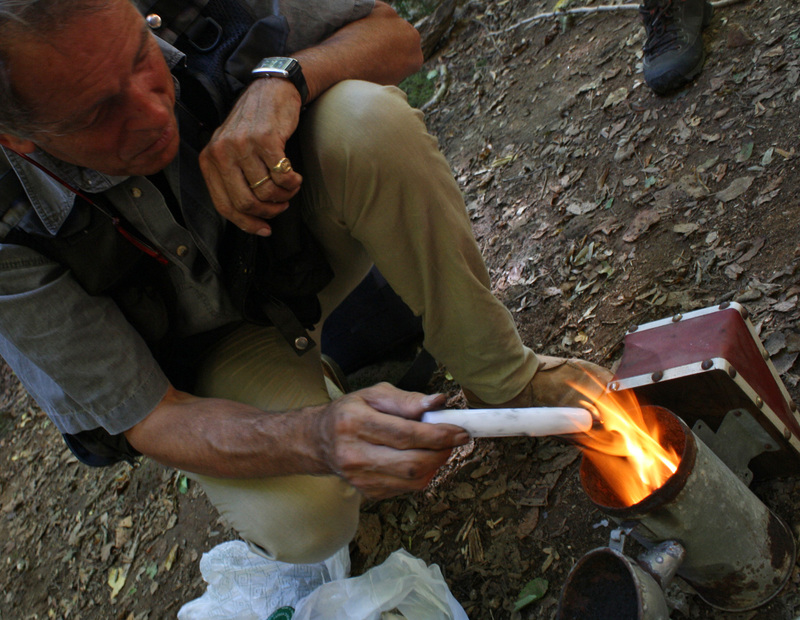 You can use kindling but best of all are impregnated carbon pellets with a saucer shaped dip to hold the incense (if you go down the sacred road). Suppliers to the film industry stock all you need or else Apiarist (beekeeping) suppliers, surprise, surprise. These latter are more ubiquitous than you might think. They also do all sorts of other things like fake ice cubes, anti reflection spray, fake cobwebs – the sorts of things you need for professional still life photography or making your own horror films. I use it mainly for creating rays from sunlight shining through a window, haze around a light source or hazy light peeking through the entrance to an Etrusca tomb, that sort of thing. It has a nice softening effect too, diminishing contrast as distance increases from the lens – a markedly different effect from a soft focus filter. This is so interesting and useful – has given me lots of ideas! Thanks for posting. Un pomeriggio e una serata d� eccezione al Palazzo del Gusto di Orvieto per chiudere in bellezza l� edizione 2008 2009 di UMBRIA JAZZ WINTER. thanks for commenting – and saving me! I visited a lot of website but I think this one has got something special in it. “Nobody got anywhere in the world by simply being content.” by Louis L’Amour. Wohh exactly what I was looking for, appreciate it for putting up. “Be nice to everyone on your way to the top because you pass them all on the way down.” by Fred Hufnagel, Sr.. Thanks for the comment – and I liked the quote, very sage!